The Spanish Minister of Foreign Affairs, José Manuel Garcia-Margallo, warned against the manipulation for political purposes of the death of young Mohamed Haidallah who succumbed to his injuries after a fight with two fashion designers in February in Laayoune. The Foreign Minister was answering a question by a member of the Izquierda Unida party on the Spanish government’s response to the hunger strike and sit-in observed since last May by the mother of the victim, Takbar Haddi, before Morocco’s Consulate in Las Palmas, Canary Islands. Margallo said this case was taken out of its strictly humanitarian framework to be used for political purposes. In his reply to a written question from the member of the Spanish United Left, Margallo said his government was in contact with Rabat to reach a most desirable solution of this matter. 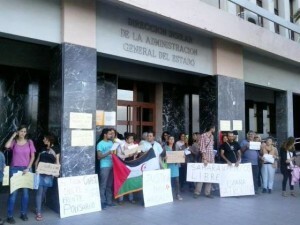 He however warned against any further incursion of Pro-Polisario separatists and activists in the Moroccan consulate premises in Las Palmas, making it clear that the Spanish authorities will not tolerate such unacceptable and illegal actions. Mohamed Lamine Haidallah’s mother was brought to Las Palmas, apparently with the help of Sahrawi activists and pro-Polisario Spaniards, and encouraged to observe a so-called “hunger strike” to “require the truth “about the circumstances of her son’s death. Yet, the findings of the investigation by the prosecutor of Laayoune attest that the young Haidallah succumbed to his injuries after a fight that is a matter of general law. But the Polisario leaders, acting under the orders of the Algerian military intelligence services (DRS,) have vainly tried, with the help of Spanish activists, to exploit the case for politicking reasons and to fuel their anti-Morocco campaigns. And this is nothing new. The Polisario always tries to exploit any common case to tarnish Morocco’s image.